The skyline of Seattle, Washington is iconic and easily recognizable. Its most recognizable element is the 600 foot tall Space Needle, built the year I was born, 1961, in preparation for the 1962 World’s Fair. It’s a beautiful structure. Unlike a lot landmarks and tourist destinations, which end up being disappointing in person, it’s totally worth visiting. Riding the elevator to the observation deck and looking out over the city and sound is an unforgettable experience. 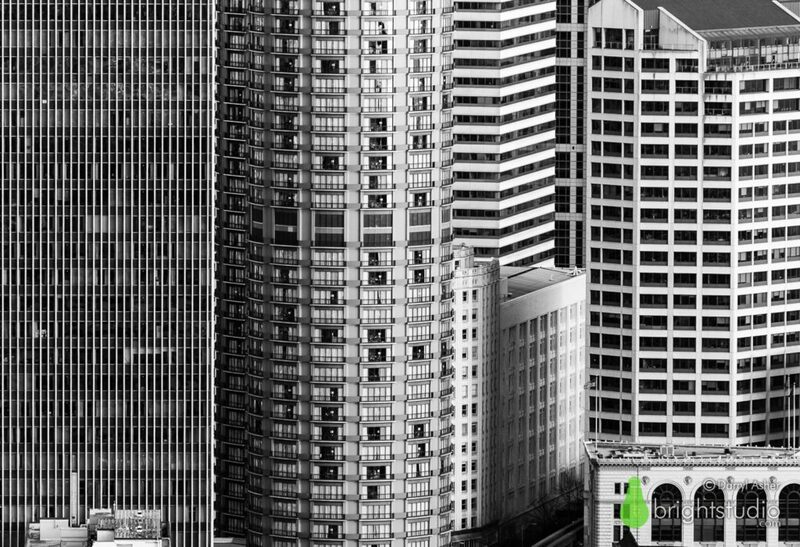 Downtown Seattle – 13×19 inch black and white print produced with museum-quality, archival materials. Shooting with a Nikon DSLR and a zoom lens set at 200mm, I was able to capture the dizzying convergence of lines, light, and shadow. The long focal length flattens the perspective, and producing the image in black and white emphasizes and geometry into semi-abstraction. Unlike the iconic and easily recognizable Seattle skyline photos, very few people would be able to immediately recognize the location of this image. Sometimes it makes sense to shoot in the opposite direction that your first instinct tells you. 13×19″ museum quality print Available in the shop (50% during May 2018).